WILLEMSTAD - The first edition of the Curaçao Pontoon Festival will culminate in musical evenings with performances by Morgan Heritage and ROCKPACK. Sumusica Curaçao B.V. will bring many Grammy Award winners and nominees to the Curaçao Pontoon Festival on Saturday 6 April. This three-day music festival that takes place on 5, 6 and 7 April at Brionplein and Kleine Werf, presents a line-up of recognized international artists in the music genres reggae and rock on Saturday night. Festival-goers who buy their tickets on time can win a Meet & Greet with the Morgan Heritage and ROCKPACK icons. Morgan Heritage is not an unknown name in the reggae scene. 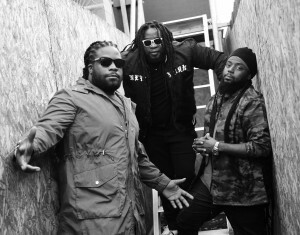 Morgan Heritage, who recently completed their tour in Europe, has scored many hits with songs like 'Do not Haffi Dread', 'Tell Me How Come', 'Down by the river' and 'She's still loving me'. In 2016, this family band received a Grammy Award for the best Reggae album with the album 'Strictly Roots'. This year Morgan Heritage was once again nominated for the same category with the album Avrakedabra. Morgan Heritage worked with several superstars on Avrakedabra, including Ziggy Marley and Stephen Marley. Their music is characterized by powerful messages and a mix of musical styles including roots reggae, R & B, hip-hop and dub-step. The music band ROCKPACK, consisting of rock legends, will also perform at the Curaçao Pontoon Festival. This rock band consists of the top artists Bill Champlin, John Elefante, Fran Cosmo, Kevin Chalfant and Alex Ligertwood. Bill Champlin is a singer, guitarist, keyboard player, arranger, producer and songwriter. In 1980 he was nominated for a Grammy Award in the categories 'Song of the year' and 'Best R & B Song'. Bill Champlin received a Grammy Award twice for 'Best R & B Song' in 1980 and 1983. This multi-talented artist is best known as the singer of the band Chicago. Some hits from Chicago are 'Hard Habit to Break', 'Look' and 'Hard to Say I'm Sorry'. Alex Ligertwood is a Scottish singer, guitarist and drummer. He is best known as the main vocalist of Santana. This Latin American rock band achieved international success with the hits 'Black Magic Woman', 'You Know That I Love You' and 'Oye Como Va'. The other band members Fran Cosmo, Kevin Chalfant and John Elefante are respectively former singers of the legendary rock bands Boston, Journey and Kansas.